This post contains affiliate links for the best travel gifts for families. Finding gifts for travelers with young children can be daunting. Those adorable headphones seem cute, but will he use them? That fly bed looks fabulous, but will the parents approve? Not to worry, Bébé Voyage has you covered. We packed our 2018 list with smart gear, affordable travel strollers and no-mess toys that babies and toddlers will love. Continue to check out this post throughout December for updated exclusives, discounts and coupon codes. It is no secret that kids require all kinds of things to make travel a survivable (and hopefully positive) experience. From stocking stuffers to splurges, here are the items most talked about by Club Bébé Voyage this year! Whether your littles like traditional headphones or a more slim style, headphones seemed to be a huge talking point this year for families. Topping the recommendations this year are the BuddyPhones, CozyPhones, and LilGadgets headphones for their performance, comfort, and ease of packing. Also check out our recent review of the BuddyPhones and grab a $10 discount on the BuddyPhones PLAY when using code BUDDYXMAS18. Are you trying to avoid have your toddlers glued to screens your whole trip? A digital drawing pad that clears at the touch of a button, inexpensive foil kits that will get your kids creating without a mess, and an the ever popular WaterWow coloring books top this year’s list of best activities to keep your little ones busy while traveling. Galt Toys, a British educational toy brand, has some beautiful options for on-the-go learning like a mosaic sticker puzzle, baby puzzles, and building straws. Check out our ever growing list of travel toys for more options in every budget and stuff those stockings with some sanity for you! We here at Bébé Voyage are always testing and reviewing the tons of gear out there for traveling families. This year, a big topic was luggage for the kids as they seek their own traveling independence. From Skip Hop to Trunki, there are options in every price range. We’ve spent a lot of time coming through the options and are always on the lookout for new designs. Marianne Perez de Fransius, Bebe Voyage CEO recently gave a rave review for the Jet Kids Bed Box, a kid’s suitcase that innovatively converts into a fly bed on the plane. These kid-friendly logbooks are a really fun way to engage your toddler/preschooler on his or her travels. Travel bloggers Elizabeth Newcamp from Dutch Dutch Goose (check out her review here) and Jules Stephan from Shades of Courage both have these logbooks and highly recommend them for traveling children. These logbooks act as a record book guaranteeing a tangible memory of the experience while keeping it fun and engaging for the children. The logbooks can unlock so many great experiences including flight maps, cockpit visits, Little giveaways for the kids, and more. Join Bébé Voyage to get a 15% discount emailed to your inbox! If your kids (or you!) are excited about their ability to use the potty, it might be time to get yourself a nice travel option for easy transitions from home to away. This year, the Firares Silicone Pads made big waves with our readers. The ever popular Potette and Graco Folding Potty also made the cut to round out our practical gift category! Snacks. The ever present demand of our hollow-legged travel companions. While traveling, snacks can quickly become a budget breaker if you don’t come armed with an arsenal of choices. Our readers raved about the benefits of reusable snack bags for keeping things healthy and cost-effective. I know these don’t seem like a great gift for kids, but they are a fantastic way to teach autonomy even in rushed, hectic travels. You can get adorable ones to match your child’s personality and make them exciting to open on Christmas morning by using them to wrap small stocking stuffer items like candies or new crayons. When it is time to put them to use, our littles gain the independence to choose and pack their own favorite foods, offering them some control and power to motivate their participation in planning! Rounding out our recommendations for things your littles could benefit from this year are travel organizers. Especially if your travelers are a bit older, this is a great option for letting them pick their own activities to pack while also limiting the amount of stuff traveling with you. They fold up to a carry bag and can help to corral the mess and if you are a real go-getter, you can even wrap it pre-filled with goodies so they can dig through their new treasures! In our opinion, one of the best gifts for traveling parents is our Bébé Voyage Travel guides! Not just because we wrote them, but also because we use them ourselves to help us plan our trips and figure out what to do in our own cities. They are are treasure trove of information ranging from family friendly hotels and community recommended restaurants, indoor and outdoor kid-approved activities, to how to find a babysitter and what to do if your baby gets sick while traveling. We currently have guides for London, Paris, Chicago, Tokyo and Sydney with more coming soon! In a new initiative, whenever you purchase a guide, you also have the option to make a donation to our charity partner It Takes a Village, which supports maternal health around the world. So not only are you helping yourself by purchasing a Bébé Voyage travel guide and easing the pain of planning, but you are also helping mothers and their children get access to safe medical care. 2018 was the year of the packing cubes on the Bébé Voyage circuit. It is almost impossible to narrow down the best brand as it seems there are fantastic tested choices in every price range from budget to splurge. Compression cubes are also being reviewed as worth an extra investment. Eagle Creek and eBags seem to be the most talked about brands; however, the general consensus is that you can’t go wrong as long as you pack your family with cubes! We all know sleeping on flights is never particularly restful and there has yet to be a miracle invention to change the pillow game. However, we did see some inventive newcomers on the scene this year! The Trtl Pillow has come with mixed reviews from readers, but could be worth a try if you’ve had all of the others. Alternately, there is this twisty memory foam pillow that looks like it could be manipulated into whatever your dream pillow is or this more traditional pillow that eliminates the bulk behind the neck. For the love of aching backs, carriers are always a hot topic here at Bebe Voyage. This year has brought high praise for the Osprey Poco carrier though the price tag might put it in the “Splurge” category. At half the price, the Phil & Teds lightweight carrier and Deuter Kid carriers have also brought in great reviews. We are always testing and reviewing carrying products here at Bebe Voyage and you can check out our wealth of information in the Gear section of the site! We love bags with a passion. As traveling parents, we know we are going to be carrying ALL of the things. Having a great bag makes all the difference while running through airport terminals, dealing with blowouts at rest stops, or making snacks and activities appear in a jiffy. The Kipling Diaper Bag Backpack ranked high with our readers this year and the Graco Smart Organizer was a hit as well. JuJuBe bags were a surprise hit and dads can always enjoy the DiaperDude. Nervous about how you will get through the airport this holiday season with a toddler and a suitcase? Then the Lugabug is for you! 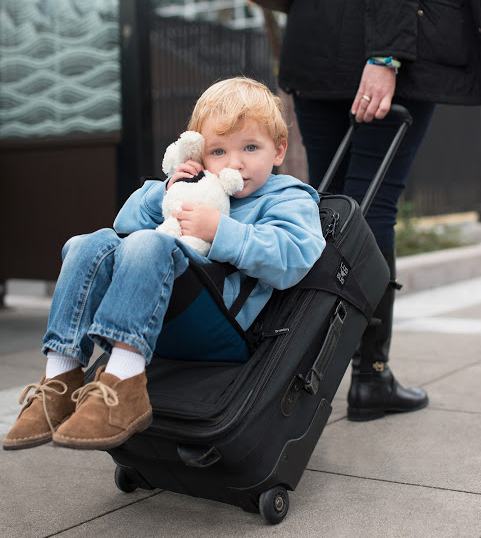 This simple device turns any rolling suitcase into a seat for kids under 60lbs and is the perfect way to move kids and luggage around without needing an extra hand or separate stroller. This is the perfect accessory for minimalist travelers. Join Bébé Voyage to get a whopping 20% discount code emailed to you on this super convenient travel product. Sleeping is an ever present challenge for families on the go so we keep our ears perked for great travel beds on the market. As always, the Lotus travel cribs were recommended and this year we saw the KidCo PeaPod making waves in our recommendations. Intex and Shrunks topped the inflatables list this year and the 1st Class Kids Travel Pillow was the highest recommended airplane pillow, with the Fly Tot in a close second. A new hot item on the market is the Slumberpod, an ingenious (but not yet reviewed by us) solution to parents constantly on the go. This brand new product is a portable sleep cot for infants innovative solution. Become a Bebe Voyage member to receive our 10% discount code! We also love the portable sleep cots at Regalo Baby, which are great for little ones who have outgrown cribs. Keep your eyes peeled on our Instagram @bebe.voyage this month when we give a cot away! The last hot item for traveling parents we want to add this year are our favorite strollers and car seats. The overwhelming favorite for single strollers continues to be the Mountain Buggy Nano for its versatility and the BabyZen YoYo is a splurge, but splurge well spent. Juilet Perrachon, Bébé Voyage co-founder, in Paris with her two kids and her BabyZen Yoyo. The Uppababy Vista is a popular option for a double stroller, but often reviewed as too heavy and bulky for easy travel. The Evenflo Pivot Xpand was a great alternative as well as the Maclaren Twin and Zoe XL2. There you have it, dear readers! Thanks to all of your suggestions, reviews, and recommendations, we have been able to pick out the best of the best that 2018 has to offer. We are looking forward to sharing travel with you in 2019 and hope you’ve been inspired by our suggestions! This post contains affiliate links for the best travel gifts for families. Please consider purchasing through our post to support Bébé Voyage as we continue to work to bring you advice, recommendations, and real stories from families all over the world with the goal of encouraging family travel.